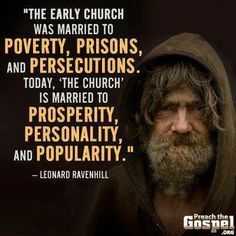 Leonard Ravenhill is the type of preacher that is needed today. Yet, many places no longer have times of prayer. Churches are kept afloat by sermonettes or entertainment, not because of the clear message of the Gospel. The Gospel is all about Jesus Christ, and not about what we bring to the equation. May God daily, even hourly, bring His holiness to our attention so that we will humble ourselves before Him. If we are ever to see revival, which we desperately need in this day and hour, we must get back to the basics. Fathers, the best gift you could receive today would be the overwhelming desire to seek repentance from the thrice-holy Almighty, the One whom we have long forsaken for the pleasures of the world. Paul reminds us that we are to set our affections on things that are heavenly, not on the things of this world. We need revival in America and in England, but at what price will it come? Oh that God would break our hearts for the reality that eternity is closer than we wish to imagine! Our churches are being crushed under the weight of worldliness and a desire to please man instead of Jesus Christ. Too many are not just guilty of watching the Bride of Christ being assaulted, but are guilty of being involved with the assault and then want to still claim to be a “Christian.” May God have mercy on us for such arrogant thinking that is only taking people to hell! Oh my friends, listen to this and weep for those who are dying in their sins! For those of you who do not know Christ, please know there is room at the cross for you if you will BUT COME!